Look like a pin up girl even with your short hair! Thought Pin Up Hairstyles For Short Hair are impossible to do? They may be a little tougher to get, but there are some possibilities. Women who have short hair during the 1940s often wore their hair in high curls. This is accomplished by first pin-curling the hair, then combing or brushing out the curls. 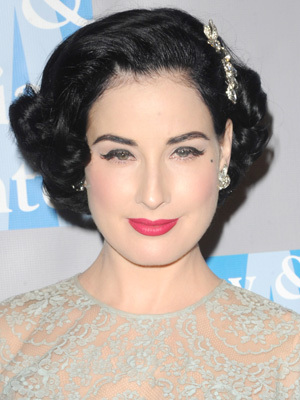 This is one of the best pin up hairstyles for short hair. In fact, it is the most popular! What is a pin curl? It is a small curl, about an inch or less in diameter, set in wet hair and held in place by a bobby pin or hair pin. Usually, these curls are crisper-looking than curls set with the use of rollers. Pin curls work perfectly for short hair because the weight of longer hair can pull the curl out of shape. By adjusting the size, location and direction of the curls, the wearer can create many different hairstyles. Pin-curling does take some time and it usually must be done the night before the hair is to be styled. Yes, you might wonder why because victory rolls are ofter worn in longer hair but before you protest... they work on ANYONE with hair more than a few inches in length. These rolls are open rolls that were popular during the World War II, which inspired the name. It is set only on the front of the head, using the hair the ordinarily makes up the bangs. To achieve these rolls, the hair must first be curled toward the back of the head. 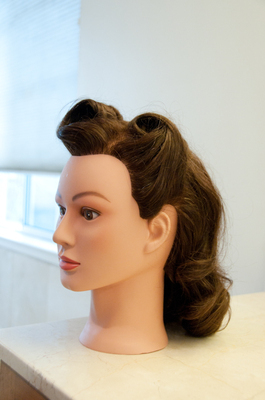 In the 1940s, this was usually done by setting it on rolls; modern stylists may use a curling one. These rolls are usually worn in pairs, and could be set symmetrically or asymmetrically. When worn in short hair, victory rolls were usually paired with pin curls at the back of the head. Another one of the best hairstyles for short hair! Pin up hairstyles for short hair are so classy and this is a knotted or crocheted net worn to confine the hair. It can be either plain or brightly colored and decorated with beads. These are often worn during the Renaissance period by fair performers, it actually orginated in the 1930s and it become popular during World War II. This hairnet is quite versatile and it can be worn by anyone whose hair is long enough to pull back in a ponytail – even a short one. Now, you've got some ideas to style your short hair with these pin up hairstyles for short hair. It's time to pose for the camera, but don't forget! You should play the part of a pin up model, red lips, smokey eyes and facial mole. Look classic or look ala Marilyn Monroe!